^ （波兰文） The 1939 Campaign. ww2.pl. [2012-02-23]. （原始内容存档于2013-12-11）. ^ 7.0 7.1 （捷克文） Polská kampaň. valka.cz. [2012-02-23]. 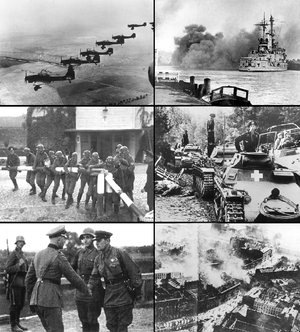 ^ 9.0 9.1 9.2 9.3 9.4 （英文） Invasion of Poland - Fall Weiss. achtungpanzer.com. [2012-02-23]. ^ （中文） 中華人民共和國國防部. mod.gov.cn. [2012-02-23]. ^ （波兰文） Kampania Wrześniowa 1939. 1939.pl. [2012-02-23]. ^ （波兰文） Kampania wrześniowa. portalwiedzy.onet.pl. [2012-02-23]. ^ 43.0 43.1 （英文） The Avalon Project : Documents in Law, History and Diplomacy. Yale.edu. [2009-01-11]. ^ （英文） Hitler's lightning strike: the German army's training, discipline and Blitzkrieg tactics--directed by the supremely confident Fuhrer--swept away Polish resistance in 1939. It took the shells-hocked Allies another three years to catch up.. goliath.ecnext.com. [2012-02-23]. （原始内容存档于2010-09-04）. ^ （英文） Text Version. fdrlibrary.marist.edu. [2012-02-23]. ^ （英文） Viscount Halifax to Sir N. Henderson (Berlin). avalon.law.yale.edu. [2012-02-23]. ^ （英文） Sir H. Kennard to Viscount Halifax (received 10 a. m.). avalon.law.yale.edu. [2012-02-23]. ^ （英文） Sir N. Henderson to Viscount Halifax (received 9:30 a. m. August 31). avalon.law.yale.edu. [2012-02-23]. ^ （波兰文） Armie i samodzielne grupy operacyjne Wojska Polskiego 1939. portalwiedzy.onet.pl. [2012-02-24]. ^ （英文） The 7TP, VAU33dw, VAU33jw, 7TPdw, 7TPjw. mailer.fsu.edu. [2012-02-23]. （原始内容存档于2009-03-23）. ^ 100.0 100.1 （英文） The Naval War in the Baltic, September – November 1939 (PDF). bdcol.ee. [2012-02-24]. ^ （德文） Ziel vernichtet. zeit.de. [2012-02-24]. ^ （英文） World War II Moments in History. ehow.com. [2012-02-24]. ^ （英文） The Battle of Westerplatte. gdansk-life.com. [2012-04-07]. ^ （英文） The Defense of the Polish Post. gdansk-life.com. [2012-04-07]. ^ （英文） Westerplatte (PDF). muzeum1939.pl. [2012-04-07]. （原始内容 (PDF)存档于2011-11-04）. ^ （英文） NOTE OF THE GOVERNMENT OF THE U.S.S.R. DELIVERED TO THE POLISH AMBASSADOR IN MOSCOW IN THE MORNING OF SEPTEMBER 17, 1939. electronicmuseum.ca. [2012-02-24]. （原始内容存档于2012年3月6日）. ^ （英文） The Polish September Campaign 1939. historylearningsite.co.uk. [2012-02-24]. ^ （英文） The Attack on Poland. historylearningsite.co.uk. [2012年1月22日]. ^ 157.0 157.1 （英文） Polish War, German Losses. The Canberra Times. 1939年10月13日 [2012-01-22]. （原始内容存档于2009年6月30日）. ^ （英文） Nazi Loss in Poland Placed at 290,000. The New York Times. 1941 [2009-01-16]. （原始内容存档于2009-02-07）. ^ （波兰文） Tablica pamiątkowa (ul. Olsztyńska). sztetl.org.pl. [2009-01-16]. ^ （英文） Investigation concerning the murder of approximately 300 civil and military inhabitants of Grodno in September 1939 by the officials of the Soviet state.. ipn.gov.pl. [2012-02-24]. ^ （英文） Some data about the tank forces of the decisive WW2 front. wio.ru. [2012-02-24]. ^ （俄文） Вторжение в Польшу. 1939. polska.ru. [2012-02-23]. ^ （英文） Polish experts lower nation's WWII death toll. AFP/Expatica. 30 July 2009 [2009-11-04]. （英文） Nazi Loss in Poland Placed at 290,000 (新闻稿). The New York Times. 28 September 1941 [2009-01-17]. （英文） Operations in Poland. ibiblio.org. [2012-02-23]. （英文） Invasion of Poland. ww2db.com. [2012-02-23]. （英文） Statistics including September Campaign losses. feldgrau.com. [2012-02-23]. （英文） Blitzkrieg in Poland. schoolshistory.org.uk. [2012-02-23]. （英文） 1939: Germany invades Poland. news.bbc.co.uk. [2012-02-23]. （英文） World War II Armed Forces – Orders of Battle and Organizations v. niehorster.orbat.com. [2012-02-23]. （原始内容存档于2012-03-04）. （英文） Nazi invasion of Poland in 1939: Images amd Documents from the Harrison Forman collection. www4.uwm.edu. [2012-02-23]. （原始内容存档于2012-02-10）.